Follow the steps below to learn how to connect your Socket Scanner with your iPod or iPhone. From the home screen select the "settings" application pictured below. Once in the settings turn on your scanner, which will produce a blue light that will flash on your scanner. Once in the settings, you should see "Bluetooth". Click on "Bluetooth" and it should take you to the "Bluetooth" settings screen. If your bluetooth is off, then hit the button to turn it on as pictured below. The button should now say "On"
When the Bluetooth is turned on, it will begin searching for devices near the iPod or iPhone to pair with. You will see a device pop up titled "Socket CHS [0F7064] (yours will be different). Tap on this and let it pair and connect. Once it is done, it will say "Connected". From the home screen select the "settings" application from your application tray. Once in the settings turn on your scanner, which will produce a blue light that will flash on your scanner. 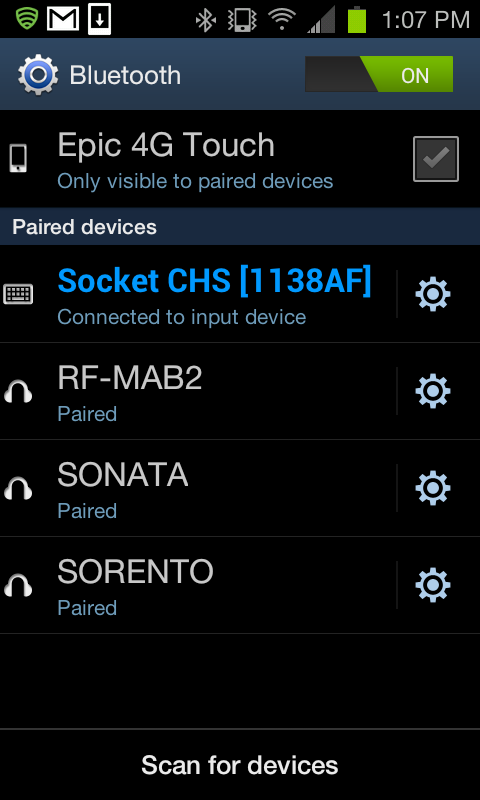 When the Bluetooth is turned on, you will need to hit "Scan for devices". 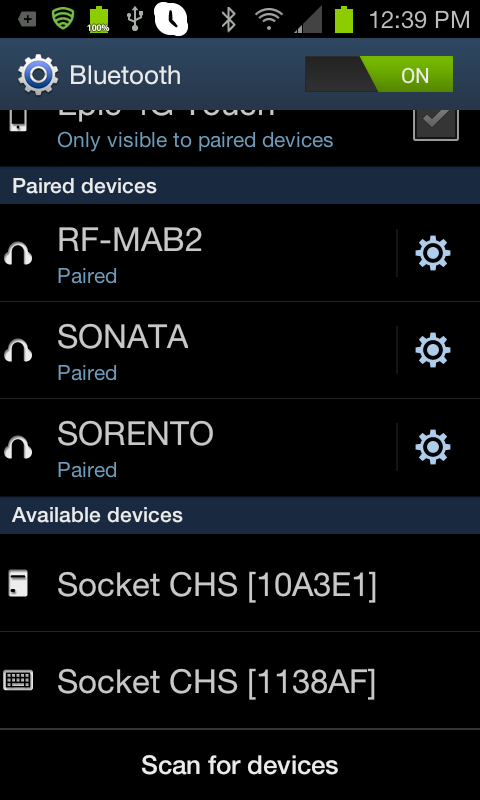 You will see a device pop up titled "Socket CHS [10A3E1] (yours will be different). Tap on this and let it pair and connect. Once it is done, it will say "Connected to input device". To connect your Plug-On-Top socket scanner, first navigate to db.neatoscan.com on your PDA. Download Socket Scan WM5,WM6 file on your PDA and install it to your device. Once that is complete, navigate to "Start>Settings>Personal Tab>Buttons". Select Button 5 and assign it to SocketScan using the drop down menu below. Hit the "X" or "OK" button in the top right corner. Go to "Start>Today" to get back to the main screen or the desktop of your PDA. Hit the button you just assigned to SocketScan or go to Start>SocketScan (if it's your first time, then go to "Start>Programs>SocketScan>Socket Scan, then "Start>Today") in the bottom right corner you will see a socket Scan icon, pictured here: . Put your scanner on top of your PDA and it should say "Openning Scanner" and then it will make a series beeps to indicate it's connected. The button you assigned SocketScan to will be the button you use to trigger the laser each time you scan. Please note: If your scanner was purchased from us, you can just place the scanner on top, open SocketScan with button 5 (left side of PDA, button closest to the bottom) and it should automatically connect. Please Note: If you do not have SocketScan installed, you will not find the SocketScan icon. To download SocketScan, please browse to db.neatoscan.com. For Windows Mobile 5 and 6, you must download SocketScan WM5, WM6. For Windows Mobile 2003, Pocket PC or Windows Mobile 2003 SE you need to SocketScan PPC 2003. All wireless SocketScan scanners need Connect Agent!, if you are Windows Mobile 5 or 6, then download Connect Agent WM5, WM6. For PPC or 2003, please download CEConnect!Agent PPC 2003. You can click these links on your PDA directly, or download them to your PC and transfer them to your PDA. Once they are on the PDA you can open them by finding them in your File Explorer(Start>Programs>File Explorer). Power-on the scanner by holding down the small power button shown in Figure (1) until the scanner light starts flashing blue. Connect the scanner by pushing button 5 or the button with the "Record" symbol on the left side of the PDA shown in Figure (2). Tap the socket scan icon shown here: . Tap the “Connect CS” menu Figure (3). After a few seconds the scanner will be connected. Activate Neatopricer software by going to Start>Programs>Neatopricer. Note: When you are finished using the system, tap the socket scan icon and hit "Disconnect CS". Then power off your scanner by holding the button in Figure (1). Once done make sure to attach the appropriate chargers. Note: If you have installed the software on your own PDA (i.e. Did not purchase it direct from us) your buttons Figure 6 & 3 will not be pre-programmed as shown. 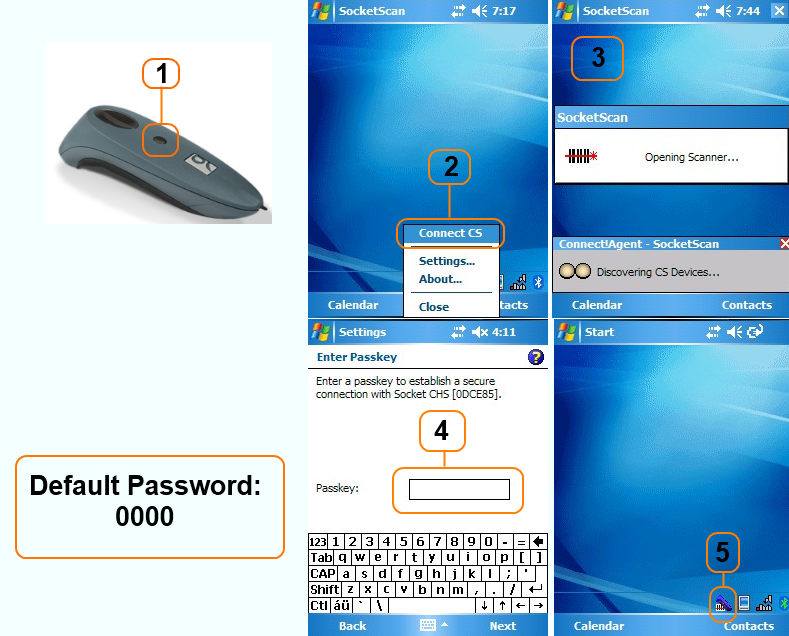 To set it up as shown, simply setup Figure 6 to automatically start the Neatopricer application, and Figure 3 to launch the SocketScan application. You can accomplish this from the Control Panel of your PDA. See your PDA's documentation for more information. Please Note: If you do not have SocketScan installed, you will not find the SocketScan icon. To download SocketScan pleae browse to db.neatoscan.com. For Windows Mobile 5 and 6, you must download SocketScan WM5, WM6. 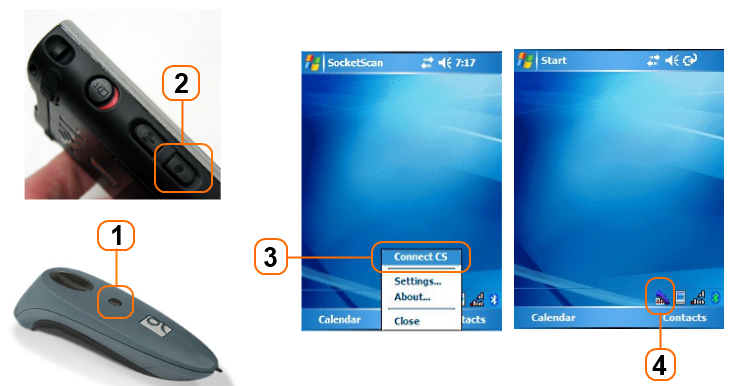 For Windows Mobile 2003, Pocket PC or Windows Mobile 2003 SE you need to download SocketScan PPC 2003. All wireless SocketScan scanners need Connect Agent!, if you are Windows Mobile 5 or 6, then download Connect Agent WM5, WM6. For PPC or 2003, please download CEConnect!Agent PPC 2003. Open SocketScan by going to Start>Programs>SocketScan. Click "Start" and then "Today". 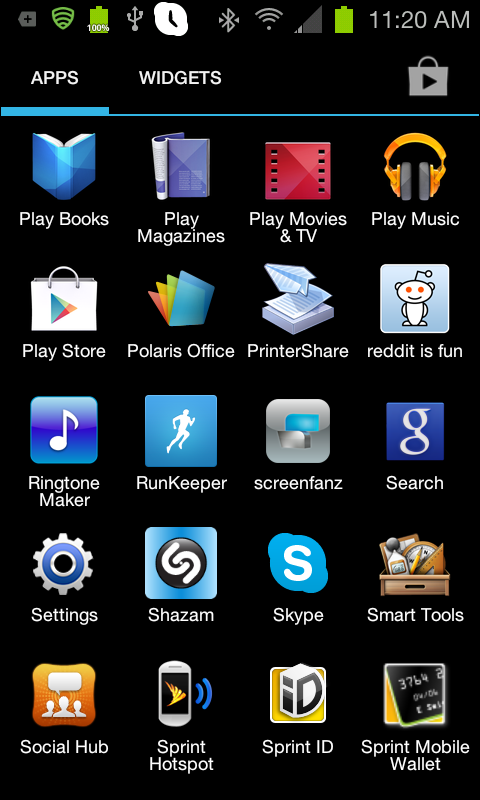 Once open the icon will show in the bottom right corner shown here: . Tap the SocketScan icon mentioned above and hit "Connect CS" shown in Figure(2). Figure (3) shows what will happen once you hit Connect CS. Once it has discovered your device you will be prompted for a password. The default password is four zeroes or "0000", shown above. After you enter the four zeroes hit next. The device should then be connected as shown in Figure (5).